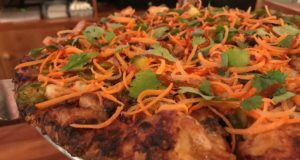 Summary : Detroit-style pizza is truly unique, as it's cooked in an auto part pan. Via 313 brings their pies to the most unlikely of places: Texas. But it's been a hit there -- and for good reason. 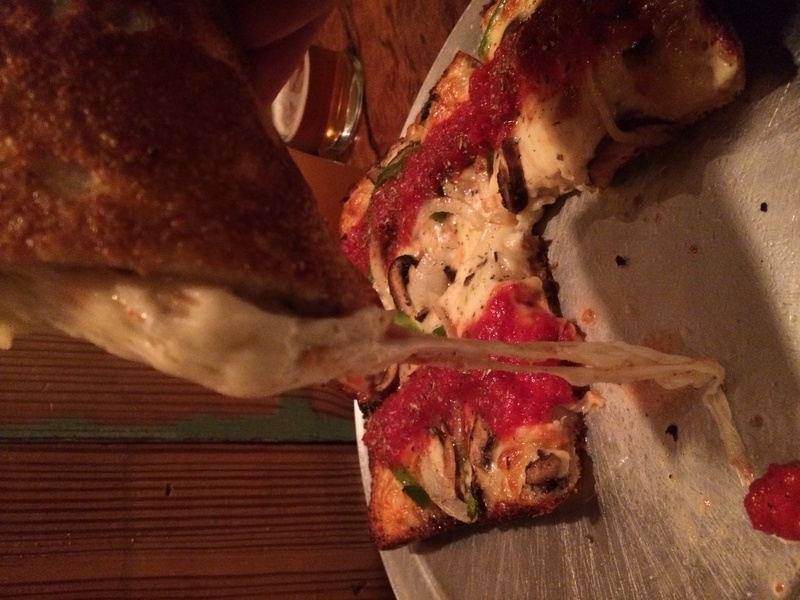 You’ve probably heard of New York style pizza. And Chicago? Well you know that’s deep dish. 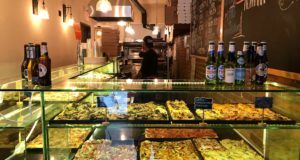 In the United States we have many other styles of pizza — some which we’ve adopted from other countries (like Neapolitan pizza from Italy) and others which are home grown (like Hawaiian pizza with pineapples and ham). 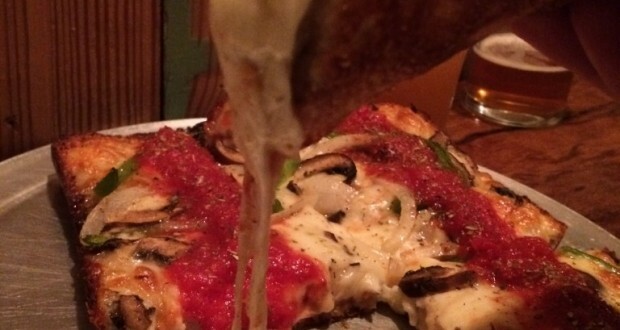 One of the lesser known regional styles of pizza in the United States hails from Detroit. That’s right. Detroit style pizza. 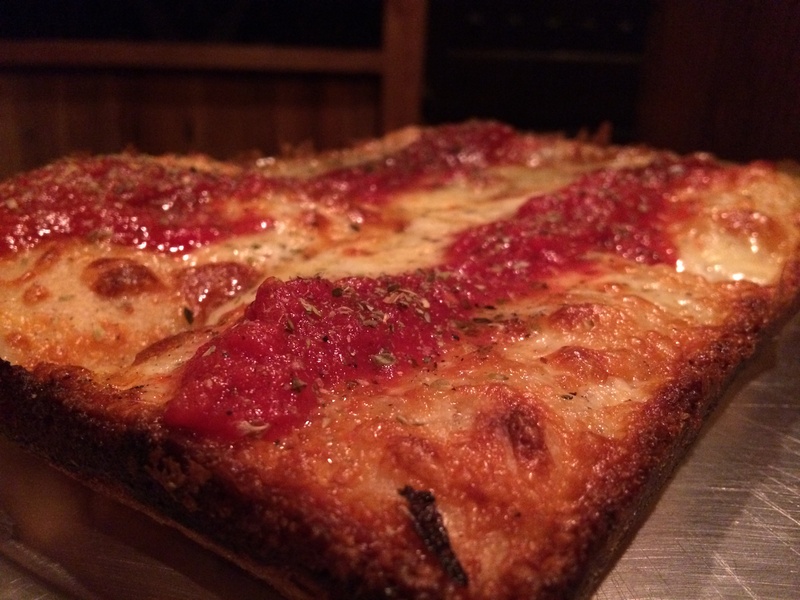 And until recently I’d never had authentic Detroit pizza. You’d probably be surprised that my introduction to these rectangular pies took place in Austin, Texas. From a pizza truck. At a bar. Back in 2009, two brothers (Brandon and Zane Hunt) moved from Detroit to Austin and realized it was hard to find good pizza there — of any style. They were determined to do something about it. 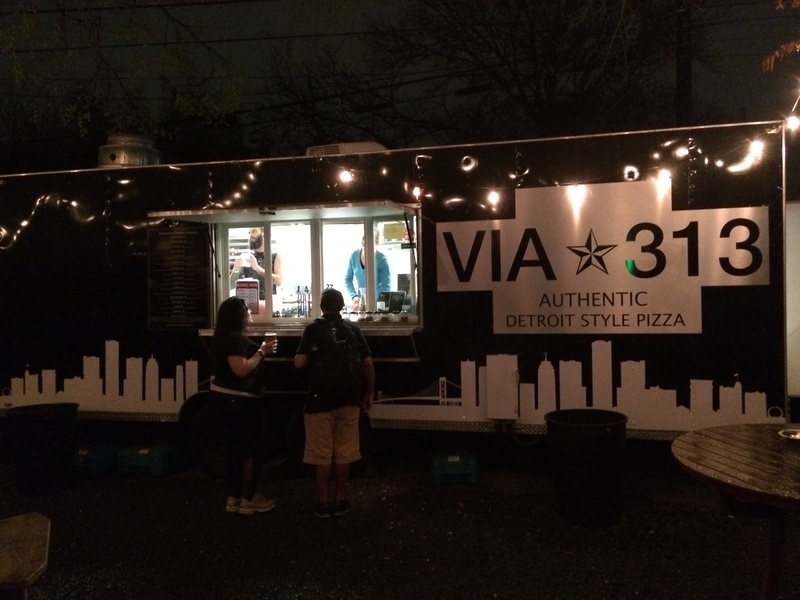 Fast forward to late 2011 when Via 313 opened its doors as a food truck parked at Violet Crown Social Club (1111 East 6th Street). The following year another location popped up at Craft Pride (61 Rainey Street) which is the one I visited. And it was just announced that they’ll be opening a full brick and mortar restaurant soon. In other words, their pizza has been a hit in Austin. 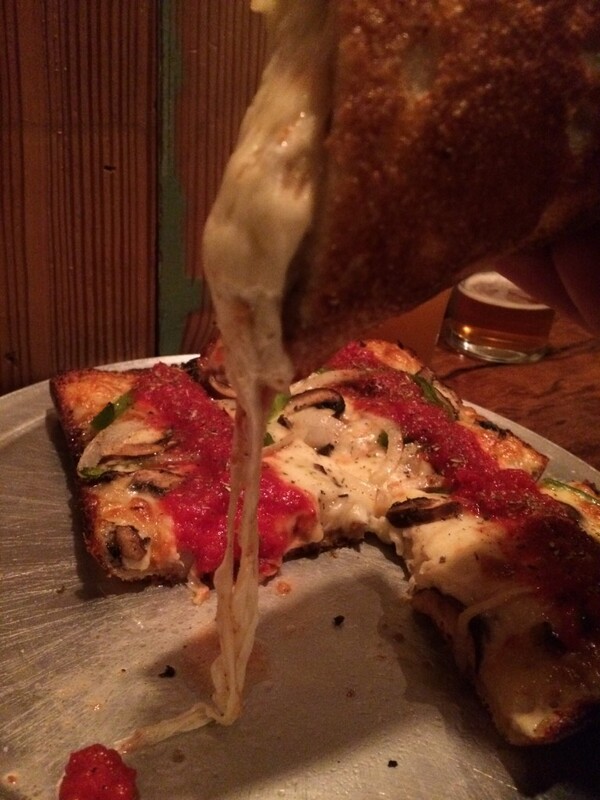 As someone who believes that pizza and beer go well together, it’s not a bad strategy to open up shop at bars. 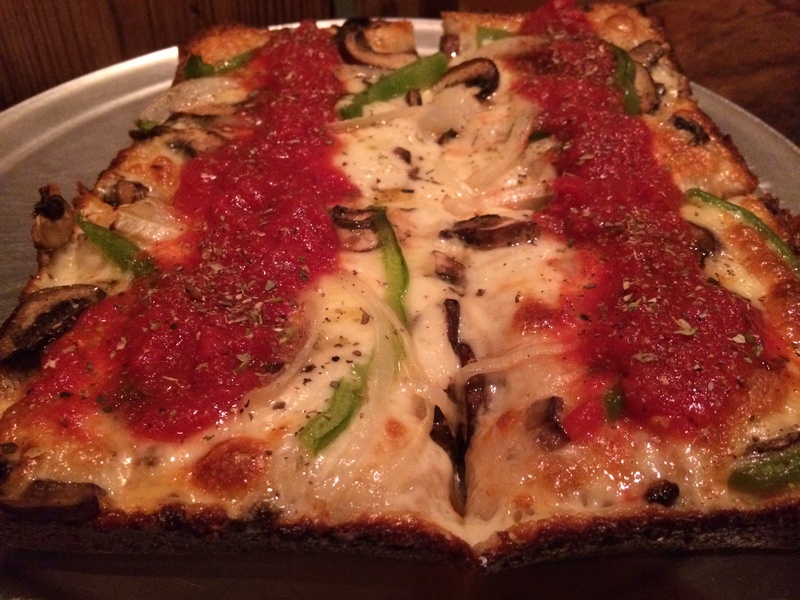 So now that you have a little history, let’s talk about what Detroit style pizza actually is. Legend has it that back in the day, assembly line workers in Detroit would bring home auto pans for cooking and baking. And over time, pizzerias began to use those pans too. The industrial steel pans enable a crispy texture to form on the outside of the pie and the folks at Via 313 also add a bit of cheese around the edge to caramelize around the dough. Another thing that Via 313 does differently is that they put the cheese on first, let the pie bake, and then put the tomato sauce on after the pie cooks. This lets the cheese cook into the bread. And while the toppings go all the way to the edges, the tomato sauce is applied in two strips. Other than the $8 cheese-less marinara pie, all pizzas range from $11-$16 and feed one person. In terms of size, a pie is equivalent to about two slices of New York style pizza. 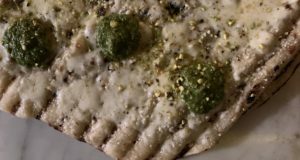 I opted for the Classic Cheese Pie ($12) which contains sauce and cheese, as well as the Herbivore ($12) which contains hand cut mushrooms (how else are mushrooms cut, by the way? ), hand cut sweet onions (same question here! ), hand cut green pepper (okay, we get the point), and black olives (which I left off). Both pies were great, but I preferred the more simple, topping-less pizza. Since this was my first experience with Detroit style pizza, I don’t want to make any generalizations. But I will say that it was a refreshing change of pace and if other Detroit style pizzerias can replicate the quality of Via 313, then it’s certainly something I can get behind.